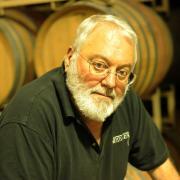 Charlie Meeker was born and raised in Dallas, Texas, where he learned about great wine from his father. After graduating from the University of Texas School of Law in Austin, Charlie moved to Los Angeles, and ever since, he’s been a distracted man. Even though he and his wife Molly bought their first vineyard in Sonoma County’s Dry Creek Valley in 1977, and opened their winery in 1984, Charlie wasn’t able to be a full-time winemaker in Sonoma County until 1999. He made the wine from 1984 to 1999, but he lived in L.A. and kept his day jobs – first as an entertainment attorney, then as a film producer, and ultimately president of Metro-Goldwyn-Mayer – in order to finance his winery habit. In Charlie’s many years making wine, he’s made a habit of experimenting, exploring, and developing new winemaking techniques. Over the years, these experiments and techniques have been refined and polished into the foundation of our winemaking philosophy. If anything, the most important aspect of Charlie’s winemaking is to always strive to do better, to never stop learning, experimenting, and honing our technique. His innovative spirit has led us to exciting wines like Fossil, Handprint, and especially his most unique wine: Frozin.